Super Savings! 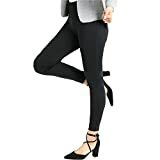 Up to 40% off on Leggings at Envy This Stuff. Top brands include LMB, Pro Fit, iZZYZX, Fit Division, Chic Classic Collection, Everbellus, Lyssé, CodeFit, GUOLEZEEV, Bamans, LEE, Indian Boutique Collection, Nikibiki, Tengfu, & NYDJ. Hurry! Limited time offers. Offers valid only while supplies last.